Pelau (pr. 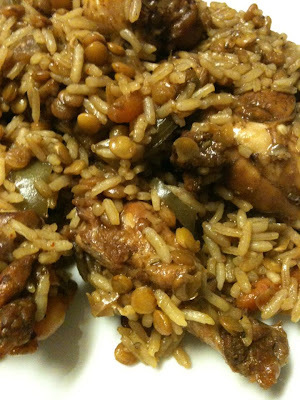 pay la'w) is a popular Caribbean dish that can be found on most of the islands. It also can be street food. I remember going to outdoor concerts or being on the street during carnival and vendors would have pelau for sale. It's a complete one pot meal and one of my go to dishes when I want something tasty with no frills. Season chicken in advance with salt, pepper, Worcestershire sauce, onions, bell pepper, garlic, thyme, paprika and all spice. Heat oil, add sugar and allow to caramelize. Add chicken wings carefully to avoid splatter. Brown chicken on both sides. Pour in 1/2 cup of water and let simmer for 5 minutes. Add lentils and carrots and another 1/2 cup of water. Simmer for 10 minutes or until lentils soften. Pour in rice, then spoon in the tomato ketchup. Stir the pot to mix all ingredients. Cover pot and let simmer until the rice is cooked. Serve with Cole Slaw on the side...enjoy! !